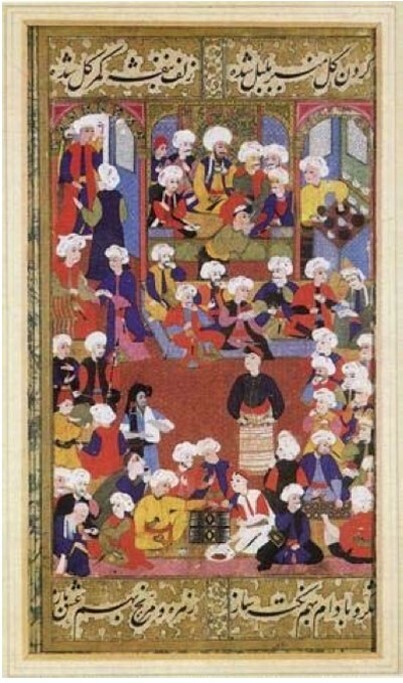 The traditional Middle Eastern coffeehouse was pictured as follows– a section designated for various businessmen involved, a space for the middle class who were generally engaged in reading or discourse on literature, and lastly, a section for the lower class, who were generally more involved in crass crowd games. Much like the importance of music in coffee shops today, all this happened whilst a band played on the side. For the first and only time, members of all classes could be found in the same coffeehouse. The coffeehouse also became a place of business, which we still see today. Coffeehouses were springing up on every street corner and were so popular people began to skip out on going to the mosque in order to grab a cup of coffee. This clash created a lot of animosity towards coffee from religious clergy. By the early to mid 16th-century, coffee drinking shifted from the realm of religion to the laymen. This shift created a new institution that radically transformed Islamic social life. The coffeehouse became a place for people to get together and speak about literature, philosophy, and politics. Not only did the coffeehouse function as a meeting place between classes, but also as an open sphere for discourse that may have been frowned upon elsewhere. Its allowance for new thought allowed the start of many revolutions, as well as new ideologies. “All these people are quite base, of low costume and very little industry, such that, for the most part, they spend their time sunk in idleness. Thus they continually sit about, and for entertainment they are in the habit of in public in shops and in the streets- a black liquid, boiling (as hot) as they can stand it, which is extracted from a seed they call caveé..”This account, as well as many others, made the integration of coffee into European society difficult at the onset. With its growing popularity, the notion that coffee was an intoxicant produced efforts to shut it out of Islamic culture. The first attempt at prohibiting coffee was in Mecca in 1511. The “gruesome” sight of worshippers drinking coffee in the mosque led to the decision to ban the beverage and close the coffeehouses. This was met with heavy opposition from the coffee drinkers, and debates ensued. Who knew coffee was so controversial? Although the ban was eventually overruled by Sultan Suleiman I, throughout the 16th century, there were several attempts at banning the beverage in various Arabic countries– none successful. As coffee spread along with the conquering of the Ottoman Empire, consumption spread throughout Europe via travelers and trade routes. The first coffeehouse in England was opened in Oxford in 1652. The first one in London was opened later that same year by Pasqsua Rosée an importer from Turkey. 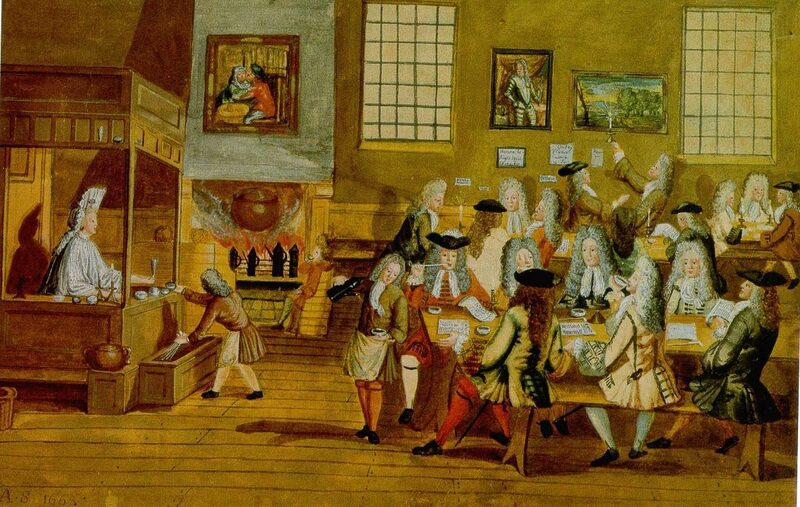 The coffeehouses originally established in England had a similar effect on social norms as the ones in the Middle East. The inherent open door policy of the typical coffeehouse turned English society’s strict class system upside down. 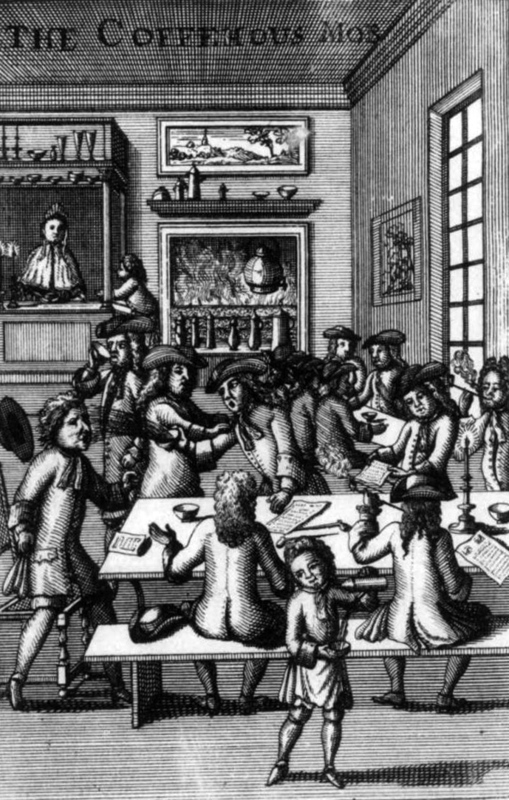 Similar to the Middle East, this meeting between the different classes led to a public sphere.This ushered in what would be called The Golden Age of the London Coffeehouse (1670-1730). The Golden Age was defined by the atmosphere, elegance, and fine art, in the typical London coffeehouse. The English coffeehouse was usually decorated with fine art on the walls, chandeliers as well as large windows providing the lighting–too bad they couldn’t take selfies back then. The influx of opinions and discourse on all topics created many disputes (there were trolls back then, also). Sometimes, disputes led to huge fights in the coffee house — coffee and fists flying everywhere. I guess you can have reality TV without a television. 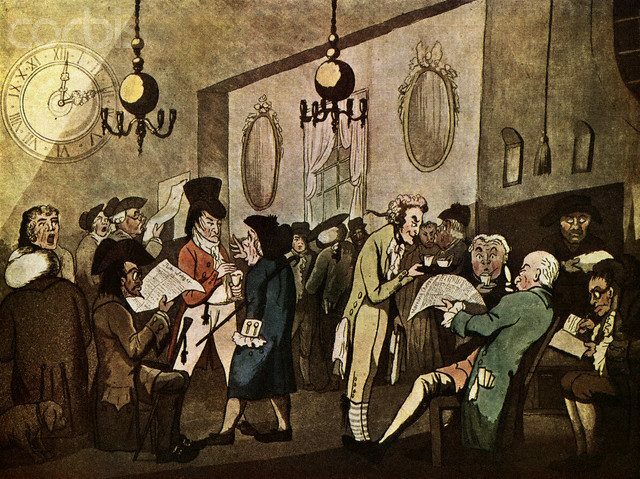 Here’s a few interesting historical facts that came about in London’s Coffeehouses.